Within minutes of news of Daphne Caruana Galizia's murder being published, shock and outrage began pouring forth. 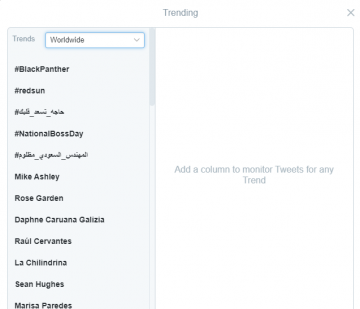 Daphne Caruana Galizia is trending worldwide on Twitter. Politicians, journalists, political movers, private citizens, backers and detractors: all were quick to condemn the as-yet unknown perpetrators who killed Malta's most known journalist. And as talk of the shock killing spread across the globe and news reports appeared on foreign media such as the BBC or Corriere della Sera, the term 'Daphne Caruana Galizia' began trending worldwide on Twitter. NGOs, the Institute of Maltese Journalists, the developers' lobby and political parties were among the first to issue statements expressing abhorrence for the killing. Prime Minister Joseph Muscat echoed the words he spoke in an impromptu press conference when he wrote on Twitter that the bombing was a "spiteful attack on a citizen and freedom of expression." We're utterly shocked and saddened with this afternoon's attack. It's time to unite on this black day for #Malta. His official spokesman Kurt Farrugia called it "a black day for Malta" and called for national unity. Dr Muscat's Nationalist Party counterpart Adrian Delia went further, calling the killing "the collapse of democracy and freedom of expression." He later also tweeted that he would be attending a vigil to be held in Sliema this evening. This is the collapse of democracy and freedom of expression. We shall not be silenced. "My heart goes out to the Caruana Galizia family. There are no words I can think of that will console them," wrote former Prime Minister Lawrence Gonzi, as he said the best way people could honour her memory was by strengthening their resolve to defend free speech and fight corruption." European Parliament president Antonio Tajani said the murder was a "tragic example of a journalist who sacrificed her life to seek out the truth." Brutal murder of Daphne Caruana Galizia: tragic example of journalist who sacrificed her life to seek out the truth. She won’t be forgotten. Alternattiva Demokratika chairman Carmel Cacopardo wrote that "these are the sort of things that happen in countries run by the Mafia" as he reiterated his respect for Ms Caruana Galizia's work and sense of conviction. European Commission vice-president Frans Timmermans weighed in, as did economic commissioner Pierre Moscovici. Shocked & sickened by the death of Daphne Caruana Galizia. Freedom of expression is one of our most cherished values. It must be protected! European People's Party President Joseph Daul paid tribute to Ms Caruana Galizia and said she was an investigative journalist of the highest calibre, and her work on the Panama Papers made the world “a more transparent and a fairer” place. German MEP Sven Giegold went one step further and said such incidents brought to mind Vladimir Putin's Russia, not the European Union. Harlem Désir, OSCE media freedom representative, urged the Maltese authorities to carry out swift, transparent investigations into the case. “She was a fierce, independent and brave investigative journalist, relentless in her efforts to uncover stories of public interest,” Mr Désir said. “Not only her family, but the entire society must know who is responsible for her death. “Silencing of journalists by killing is unacceptable. The authorities must uncover and prosecute those responsible,” Mr Désir said. The International Consortium of Investigative Journalists, which released the Panama Papers investigation and which employed one of Ms Caruana Galizia's sons tweeted the "tragic and shocking news." Ms Caruana Galizia's employers and The Malta Independent publishers Standard Publications issued a statement in which they called the murder "a threat to journalism, democracy and freedom of expression." The Strickland Foundation, which owns the Times of Malta's parent company Allied Newspapers, said it expected "an effective and forceful response from state institutions" to ensure perpetrators were caught and that journalists "can feel safe to carry out their work in their country." 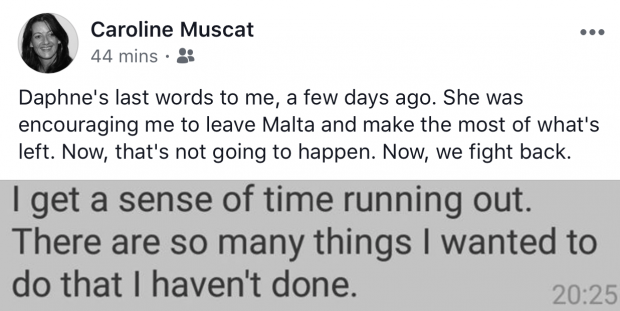 Former journalist Caroline Muscat shares the last words she exchanged with Ms Caruana Galizia. Archbishop Charles Scicluna wrote of his "great shock and sadness" and later told the press that Malta had lost "a brave voice" and one of its greatest journalists. Great shock and sadness at the brutal murder of Daphne Caruana Galizia. An appeal for a unified resolve to promote true democracy. RIP. "Malta cannot tolerate this carbomb murder," wrote former Alternattiva Demokratika chairman-turned Nationalist Party member Michael Briguglio. "Rest in peace #DaphneCaruanaGalizia." Moviment Graffiti's Andre Callus said the murder had left him speechless. Moviment Patrijotti Maltin, a right-wing political group which was often derided by Ms Caruana Galizia, said it completely condemned the "vicious" killing and called for unity "in this dark moment in our country's history." Columnist Kristina Chetcuti, meanwhile, wrote that the brutal killing would not silence critics. And as many people tried to come to terms with the afternoon's events, others began looking to what would happen in the immediate aftermath. A candlelight vigil is being held in memory of Ms Caruana Galizia tonight in Sliema.